Our eyes are made up of several parts that work in unison for us to process the world around us. These are the cornea, which draws in light; the lens, focuses the light; and the retina, which helps to process the image. If any part of the eye gets damaged, especially these three crucial parts, our eyesight is at risk. Cataracts are a common issue that we are all at risk of contracting as we age. People with cataracts have blurred vision, difficulty reading, and limited color vision. A cataract occurs when there is clouding of the lens. In a healthy individual, the lens is clear, but for individuals with cataracts, it becomes white. When light hits a clouded lens, the light is scattered making images blurred and vision difficult. Cataracts are often associated with age and diabetes. For those with diabetes, there is an increase in glucose levels in the fluid found in the eyes called “aqueous humor” which is responsible for the eyes’ protein balance. This increase leads to clouding of the lens. Staring directly at the sun, prolonged computer use, and reading in inadequate light can also be factors in developing cataracts in varying degrees. Other factors that contribute to cataract include genetics and family history. During the early stages of a cataract, treatment can include wearing eyeglasses. But this is just a temporary solution. The permanent and the best treatment is cataract surgery. As a cataract develops, eyesight deteriorates, and if left untreated, it can lead to severe vision loss. With cataract surgery, an eye surgeon will remove the affected lens and replace it with an artificial intraocular lens. The success rate of cataract surgery is 98 percent according to the American Society of Cataract and Refractive Surgery. Similar to any surgical procedure, it involves some risk. A few possible complications include infection, bleeding, swelling, damage to other parts of the eye, and continued blurriness. 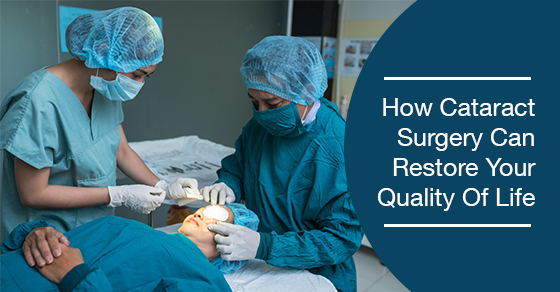 These complications can occur when the patient fails to follow post-op instructions. In 2015 alone, over 3.6 million Americans underwent cataract surgery, so it is safe to say that the procedure has made significant improvements over the decades. Cataract surgery has changed the quality of life for millions of people around the world. After successful surgical intervention, patients can see clearly. They can return to their daily activities with no contraindications or limitations in their vision.